The Gallipolis City Commission meets the first Tuesday of the month at 333 Third Avenue at 6 p.m. in the Gallipolis Municipal Building. 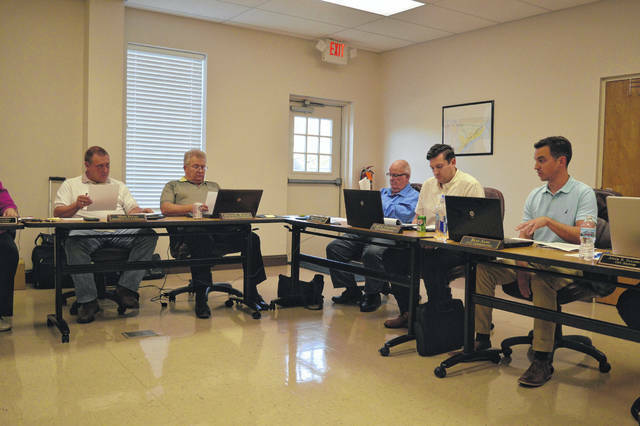 GALLIPOLIS — Gallipolis City Commission met during its regularly scheduled meeting Tuesday evening with discussion once more turning to the city code enforcement office along with the nature of its complaint filing process. Commissioner Beau Sang said he felt he would like to see additions made to the minutes of the previous commission meeting for comments reflecting statements made at the same meeting, many of which were quotes from a previous Tribune article citing an exchange between Sang and City Manager Gene Greene. Sang mentioned concern that he felt the minutes should note some of his concerns after referencing some of Greene’s during the meeting. Sang said he felt among his concerns, the minutes should reference his feelings for “how agitated Mr. Green was becoming and I felt disrespected by his comment…” alongside Greene’s concern that Code Enforcement Officer Brett Bostic was “being unfairly subjected to extra scrutiny…” Sang said he replied at the meeting that was not his intent but that he felt a written report of the code office’s activities would be of benefit to commissioners. Sang made a motion to make the changes with Commissioner Cody Caldwell seconding the motion. Commissioner Steven Wallis asked if there was any discussion. Greene said he felt if the commission wanted to see something specific from him that commissioners should vote on it and he would do that said action. Greene however felt he did not have the time to place more into his report than what he already was providing. Commissioner Tony Gallagher said he felt the city employees were doing everything they could with the resources they had. Caldwell and Sang said they did not think that was in question. Sang asked City Solicitor Adam Salisbury how one would proceed if the charter was not being followed. Salisbury looked up the legal language referenced by Sang. Gallagher said he wanted a vote taken on the subject of the minute changes as he felt the conversation was going in circles. Caldwell and Sang voted to approve changes to the minutes, the other three commissioners, Mike Fulks, Wallis and Gallagher, voted no. Wallis then made a motion to accept the minutes as written with a vote taken and the minutes were then accepted as written. Greene was concerned that the owner of the ducks received information from her father who reportedly received it from Bostic was “second hand information” and that he, Greene, had not been part of a conversation. He did say he did not believe there was a law against ducks. City Solicitor Adam Salisbury said in layman’s terms that the city did not allow wild animals. Fulks said he had concern about hearsay and social media and whether the owner had just heard that because “people say all kinds of things” and whether Cozza had spoken with Bostic. Cozza replied a letter had been posted on social media from Bostic addressing the owner of the ducks and that she had not spoken to Bostic. Bostic told the commission a complaint could be made in a few different ways. Citizens could call in a complaint, others could fill out a form reportedly connected to the city webpage and sometimes he received complaints by word of mouth from individuals stopping him in the street. Bostic said he did not normally reveal where a complaint came from but that in court he may be asked to reveal information in a legal proceeding. He used the example that at times he had received a complain via an anonymous phone call. Cozza said she did not file a complaint. Fulks said even if an individual asks a question and doesn’t file a complaint, sometimes law enforcement needed to check a situation out regardless. Fulks said if the owner had alleged she heard information through another, that the city manager should be approached. Cozza responded she did initiate communication with Greene and that he replied he was sorry the situation had occurred on social media and that maybe all complaints needed to make use of a written form. She felt the point was being missed and that she hadn’t filed a complaint and was upset with how the situation had been handled. Fulks replied the commissioners would take Cozza’s concerns under advisement. Cozza then left the meeting. At a point in the meeting, Bostic gave a run down of his recent activities with numbers regarding the code enforcement office. The McCarty family, proprietors of Second Avenue’s Colony Club, approached the commission with a desire and plan to extend service onto a fenced off area of the sidewalk in front of the restaurant. The commissioners said they were typically not the first stop for discussion and that the issue would likely need to go before the planning board.